A year ago, almost everyone who followed Virginia politics thought that Attorney General Ken Cuccinelli (R) had the inside track to winning the governorship. After all, it was in the 1880s when Virginia last gave a party just four consecutive years in the Governor’s Mansion. And Cuccinelli held one of the two positions that have served as a stepping stone to the mansion traditionally. He was running against a controversial, professional fundraiser who was best known as a “Clinton intimate,” and who was last seen getting blown out in the Democratic gubernatorial primary in 2009. Terry McAuliffe (D) had never held public office anywhere and was not even closely associated with Virginia. Additionally, Virginia had a jinx, going back to 1977, of voting against the president’s party in its gubernatorial election, which is held the year after every presidential election. So it’s actually noteworthy that McAuliffe won by any margin. Ultimately, Cuccinelli was just too socially conservative for a moderate swing state that is trending away from its traditional roots. That said, the results contain bad news for both parties, if that’s possible. Democrats are celebrating victories in at least two of the three statewide positions and have had a string of victories in Virginia. (The attorney general’s race between Republican Mark Obenshain and Democrat Mark Herring remains too close to call, with shifting vote totals, and is probably headed for a recount.) Yet the Democrats were unable to make any real dent in the large GOP majority in the House of Delegates. A tough statement from state House Speaker Bill Howell (R) after the gubernatorial race was called made it clear that the Republicans have no intention of working closely with McAuliffe. In fact, McAuliffe might need a sit-down chat with President Obama, who faces a similar situation with the Republican majority in the U.S. House. McAuliffe’s mandate from the voters, after this extremely negative campaign, is very simple: to not let Ken Cuccinelli within 100 yards of the Governor’s Office for the next four years. In that sense McAuliffe has already done what he was elected to do — keep Cuccinelli out of power. At the outset, McAuliffe’s term is a blank slate, yet severely limited by strong opposition from the Republican House of Delegates, his own inexperience and widespread suspicions about his integrity and fitness for office. In short, McAuliffe is on thin ice. As a new governor, he is entitled to his shot. Yet he has to watch his ethical Ps and Qs far more than most incoming governors, and somehow he has to make common cause with very conservative General Assembly Republicans who will be determined to make sure he doesn’t succeed. The GOP is not about to make the mistake they committed with then-Gov. Mark Warner (D); by working with him and helping him to enact a large transportation package in the early 2000s, including tax and fee increases, Republicans brought down the wrath of the base upon them while making Warner a political figure to be reckoned with. We’re pleased to feature two creative visualizations of the contest for governor. Take a look at Map 1, created by Kenton Ngo, a University of Florida political science graduate student and a native Virginian. This map shows the votes cast in Virginia on Tuesday night, color-coded by Cuccinelli, McAuliffe and Robert Sarvis, the Libertarian candidate. Note: Each dot represents 30 votes. McAuliffe’s victory, while not as strong as Obama’s roughly four-point win in 2012, was powered by the same areas: Check out all that blue in Northern Virginia, Greater Richmond and Hampton Roads, where about 70% of the state’s votes are cast in any given election. Meanwhile, despite rumors that Cuccinelli would struggle in Southwest Virginia, the Appalachian Old Dominion was a sea of deep red. While Obama is in the White House, Democrats are cooked in this part of the country. If one is looking for a takeaway from this election to apply forward, the results from Southwest Virginia may be a poor indicator for Democratic Senate candidates in Kentucky and West Virginia. Map 2 color-codes the gubernatorial results on our Political Map of Virginia, which sizes all of Virginia’s 133 localities (counties and independent cities) by population. 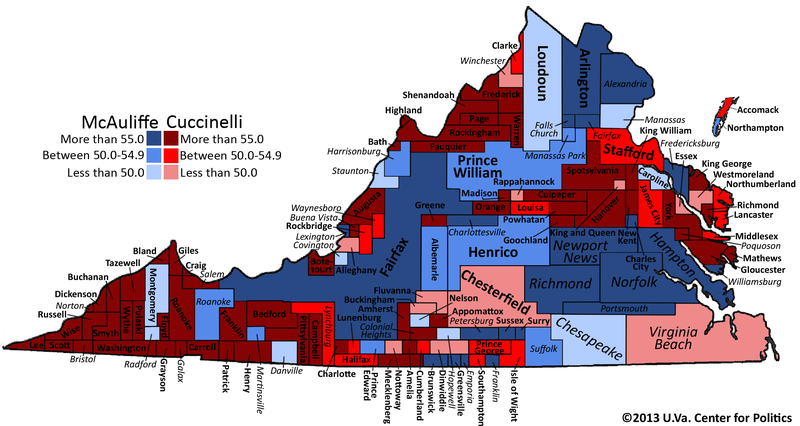 Looking at the map this way more accurately portrays how McAuliffe, like Obama, powered his way to victory through his performance in the state’s most populous areas. Note: Independent cities are listed in italicized font, counties in standard font. Obviously, one factor in McAuliffe’s victory was his substantial money edge over Cuccinelli. As of Oct. 23, McAuliffe had out-spent Cuccinelli $33 million to $19 million, an advantage that will end up being even more lopsided once the final totals are reported. Everyone saw the results on TV — at the end of October, pro-Cuccinelli ad spending was less than two-thirds of the pro-McAuliffe outlay. Money and good organization also bought McAuliffe a much better voter contact and field operation. On the Saturday before the election, the Democratic campaign knocked on almost half as many doors as it did in the entire 2009 cycle. Ultimately, turnout went up by more than two points (it was roughly 42.6% after being 40.4% in 2009, according to our calculation), which we believe was helpful to McAuliffe. Republicans would have preferred fewer people voting; state GOP Chairman Pat Mullins said as much right before Election Day: “If turnout is in the 30s, the low 30s, we’re gonna win,” he told Politico. In general, the improvement in the Democratic campaign from 2009 to 2013 was dramatic. Here is where McAuliffe’s experience (lengthy at the national level and bitter from the 2009 Virginia party primary) enabled him to score. Looking ahead, the Virginia election probably will have little predictive value for the 2014 midterms, but could say something about 2016. The bottom line is that McAuliffe won because he was the guy running against Cuccinelli, who proved to be too conservative for the middle-of-the-road Old Dominion. Cuccinelli’s defeat should send a clear message to the national GOP to move more into the mainstream on social issues, or at least to deemphasize them — if either change is possible given the composition of the Republican Party. As for the next presidential cycle, McAuliffe’s victory is great news for Hillary Clinton, should she choose to run in 2016. McAuliffe will be her Virginia chairman, and her new home away from home will be the Virginia Governor’s Mansion. What happened with the polls? As we assess the big failure of the public polling industry in surveying this race — public polling averages showed McAuliffe up by about seven percentage points, and the Wednesday afternoon tally showed him only up 2.5 points — we’re reminded of 2012. In hindsight, it seems like the best polling done in that race was not by any public pollster, but instead by the pollsters working for the Obama campaign. It’s possible that the same is true of the McAuliffe campaign. Right before Election Day, the McAuliffe campaign cautioned us that the public polls were overshooting McAuliffe’s margin, and that its internal polls suggested he would win by about four points. It turns out that they slightly overshot the final tally (again, assuming that the official canvass doesn’t dramatically change anything), but those internals painted a more conservative and thus more accurate view of the race than the outside pollsters. These internals were also pretty steady, the campaign said, showing a small but noticeable McAuliffe edge since the summer, with little variation. If those polls are to be believed, then, the big events of the fall campaign — the government shutdown, the debates, various newspaper revelations about both candidates, etc. — didn’t really make much of an impact on the campaign. That said, our hunch is that the McAuliffe staffers were surprised that they only won by 2.5 points. So it’s possible that a few outside factors had an effect: President Obama’s poor ratings in the post-Obamacare launch fiasco probably hurt McAuliffe to some degree (so much for that big Obama rally on Sunday). They might have hurt even more had the national Republican Party not wasted the first half of October junking their brand with the ill-fated government shutdown. It’s also possible, for all the hullabaloo over the many high-profile endorsements McAuliffe received from various Republicans, that rank and file Republicans ultimately didn’t want to cross over to vote for Bill Clinton’s former fundraiser, and thus came home at the end. Cuccinelli won 92% of Republicans in the exit poll, and McAuliffe won 95% of Democrats. Cuccinelli won independents by nine points, but self-identified Democrats were five percentage points more of the electorate. One factor that might have confounded pollsters was Robert Sarvis, the Libertarian candidate who took about 6.5% of the vote. He ended up (unsurprisingly) receiving a smaller percentage of the vote than his polling suggested (he was at about 9% or so in the final polling averages). It’s rare for a third-party candidate to do as well as Sarvis did in a state like Virginia, where Democrats or Republicans generally got nearly all the votes in recent gubernatorial elections. Public polls also seemed to disagree on whether Sarvis was hurting Cuccinelli or McAuliffe more and perhaps his presence in general just confused the polling. By the way, the exit poll was not definitive on this same subject. On the one hand, Republicans will note that 3% of Democrats voted for Sarvis; 4% of Republicans; and 15% of independents — a group that, we previously noted, Cuccinelli won. On the other hand, Democrats will stress that, in a two-way race question asked in the exit poll, McAuliffe would have won 48% to 46%, and 5% of McAuliffe’s voters in that part of the survey said they actually backed Sarvis, while only 2% of Cuccinelli’s support came from the Sarvis column. We believe the exit poll when it suggests that McAuliffe probably would have won a two-way contest — and maybe the pollsters would have had an easier time surveying that more basic race. Outgoing Gov. Bob McDonnell (R) deserves a double share of the blame for his party failing to win consecutive terms in office. First, there’s Gift-gate, which he owns along with his wife. Second, as a popular governor, he was unable to lead and manage his party’s process to nominate a successor. This is actually the Virginia tradition. Just in modern times, Linwood Holton (1973), Mills Godwin (1977), Chuck Robb (1985), Jerry Baliles (1989), George Allen (1997), and Mark Warner (2005) played major roles in handing off the statehouse to their party successor. Imagine if McDonnell’s choice, Lt. Gov. Bill Bolling (R), had been the GOP nominee. No one can say for sure, but there’s a good case to be made that he would now be governor-elect, especially given McAuliffe’s ultimately narrow margin of victory. Yet McDonnell couldn’t make stick among Republicans his own very public pact with Bolling — where Bolling stepped aside for McDonnell in 2009 in exchange for McDonnell’s blessing in 2013. The hidden stories of a campaign are always fascinating. Here is one might-have-been on the GOP side. Not only was there no love lost between Cuccinelli and McDonnell and their respective teams, but open antagonism reigned. This stemmed from an accumulation of incidents over four years, but especially from Cuccinelli’s upsetting of Bolling, McDonnell’s chosen successor, as well as McDonnell’s Gift-gate scandal that managed to entangle Cuccinelli, too. It is unknown whether the Speaker of the House or the Senate president pro tempore would have gone along with Cuccinelli’s request. And even if they had, there is a complicated back-and-forth whereby McDonnell could have tried to regain his powers swiftly. * Nonetheless, this stunning, headline-grabbing announcement would have enabled Cuccinelli to separate himself from McDonnell’s liabilities to a great extent; in addition, the Republican attorney general would have dominated the campaign for, possibly, weeks, sidelining McAuliffe to a certain degree. This eventuality alone probably could not have reversed the election results, yet it would have had far-reaching effects that are difficult to calculate in a vacuum. Many pundits and insiders are pointing to the Republican Party of Virginia’s decision to switch from a primary to a nominating convention as the source of its problems in 2013. The easy solution, so they say, is to use a primary to choose nominees in order to get more electable candidates. However, even if the RPV had stuck with its original primary format, Cuccinelli still would have likely defeated Bolling for the GOP nomination. To think otherwise underestimates Cuccinelli’s strong appeal among the Republican base and overestimates the number of moderate Republicans and independents who would have shown up to vote for Bolling in a primary. While it’s highly unlikely that the disastrous E.W. Jackson (R) would have won a primary battle for the GOP’s lieutenant governor’s nod, a primary alone would not have solved Republicans’ problems in 2013. That’s not to say that we don’t think a primary is better than a convention — we do, because it allows more people to participate in the process — but we don’t think a primary would have led to a different Republican nominee. Switching back to a primary may be part of the road to a Republican renaissance, but it doesn’t come close to being the whole road. McAuliffe’s major political charge as governor has nothing to with Virginia state politics. Rather, he’ll be entrusted with delivering Virginia to Hillary Clinton in both a Democratic primary and a presidential contest. Beyond the ties between McAuliffe and the Clintons, it’s possible that McAuliffe ’13 and Clinton ’16 would have other similarities: Robby Mook, McAuliffe’s campaign manager and a former campaign aide to Clinton ’08, has been mentioned as a possible manager for Hillary’s expected second run for the White House. Mook and his team, by the way, deserve a lot of credit for running a strong race in support of McAuliffe. Meanwhile, we’d be remiss not to mention the other, less dramatic gubernatorial result from Tuesday night: Gov. Chris Christie’s (R) crushing victory in New Jersey. Does the Garden State result provide a blueprint for Republicans nationally? Well, certainly the party would be wise to find politicians with as much obvious charisma and talent as Christie (so would the Democrats, for that matter). But let’s not go overboard here: Christie is a unique case, and he was aided (as governors sometimes are) by an apolitical admiration from New Jersey residents for his response to Hurricane Sandy last fall. He also was essentially unopposed for reelection: Challenger Barbara Buono (D) was very weak, and she attracted no help from national Democrats. One other thing: Christie is an incumbent, and as we’ve previously noted, four out of five incumbent governors who have made a general election ballot over the last half century have been reelected. That Christie himself beat an incumbent, Jon Corzine (D) in 2009, is further testament to his political skill. Christie would be a formidable player if he indeed chooses to run for president (and all indications are that he will). But the conservative GOP base is very skeptical, and even with a big reelection victory, Christie still has an uphill climb. We’ll have plenty of time in later editions to break down his chances. In a special U.S. House primary election in AL-1 on Tuesday, establishment Republican Bradley Byrne defeated Tea Partier Dean Young in a close race. This is unquestionably a victory for national Republicans and their allies, like the Chamber of Commerce. Byrne is seen as a quality candidate who won’t say and do things as a congressman that will hurt Republicans, while Young is a birther bomb thrower who probably would have become a headache for the GOP. Byrne should coast in the general special election for this seat, which used to be held by ex-Rep. Jo Bonner (R). Meanwhile, the battle between the establishment and the Tea Party rages on. Even though the national climate has gotten worse for Democrats after their shutdown sugar high of mid-October, they continue to receive incremental good news in the House. Rep. Jon Runyan (R, NJ-3), the former Philadelphia Eagles star first elected in 2010, announced his retirement on Wednesday. Runyan is one of 17 Republicans to hold a district that Obama won in 2012 (52% to 47%), and it’s also a rare district where Obama actually did better in 2012 than he did in 2008. We’ll have to see how the fields develop on each side, but this is a seat that Democrats, in our view, basically had little or no chance to win while held by Runyan. But now that it’s open, NJ-3 becomes an important piece of any future Democratic House majority. We’re moving the rating here from Safe Republican to Toss-up. *For more info, see the fourth paragraph of Article V, Section 16 of the Virginia Constitution.